The Italian Julia Alpini Division marches into the mountains. 28 October 1940. 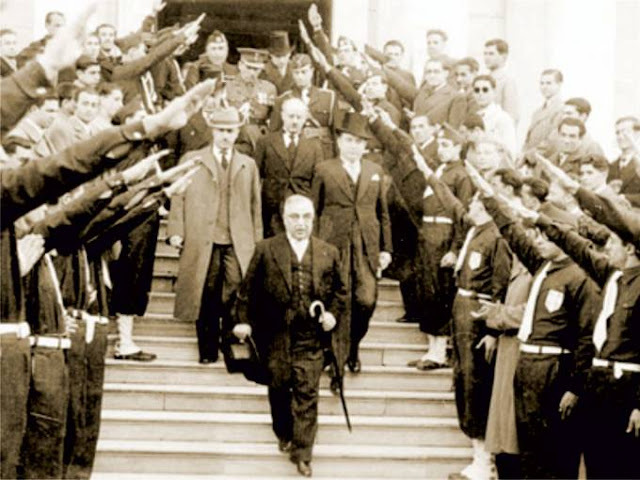 Italian/Greek Campaign: Greek dictator Ioannis Metaxas on 28 October 1940 rejects all demands from Italian dictator Mussolini by silence and appoints General Papagos as Commander in Chief. Half an hour before the expiration of the deadline, the Italians attack. 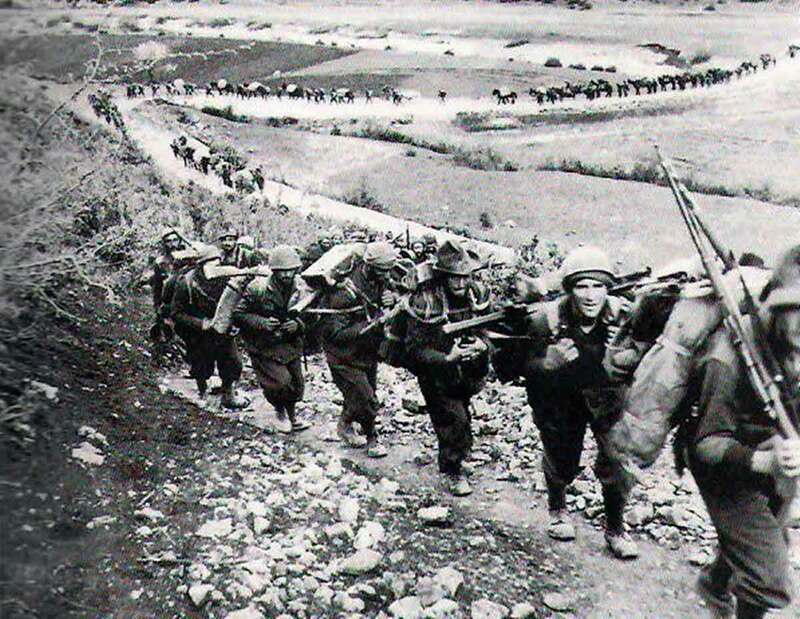 Employing 380 (largely obsolete) aircraft, 163 (light) tanks and large naval forces (which must look over their shoulders toward the Royal Navy) along the coast, the Italian land forces march forward. It is an odd time to attack, as the weather already is turning, especially at the higher elevations. This favors the defense. The power of air supremacy is limited against dug-in defensive positions in the mountains, too. The Greeks are ready for the attack, being well-positioned and holding excellent defensive positions supported by natural geographical features. They have 30,000 men in position, but no armor and only 77 (also obsolete) planes. The Italians cross the Kalamas River five miles off the front along the coast, but this direction basically leads nowhere. In the mountains, which is the strategic direction, they face poor weather and make virtually no progress. The Italian Julia Division moves forward in the opening moves of the Battle of Pindus. 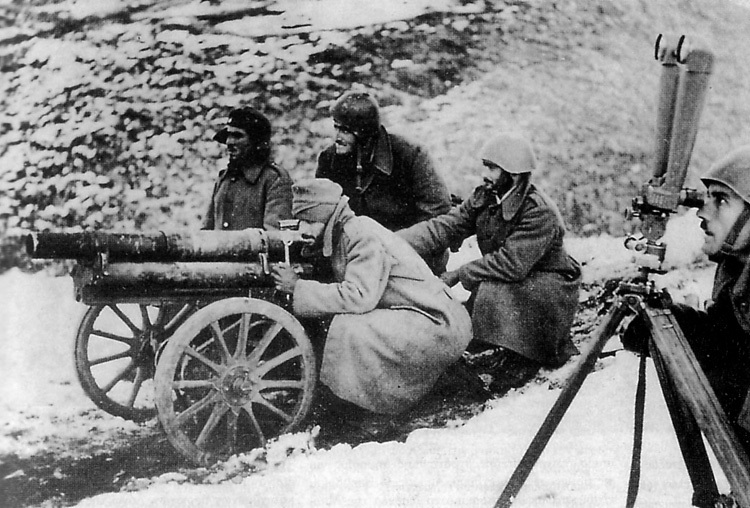 Their objective is the vital communications point of Metsovo, whose capture would decide the battle to the north. A long column of men advances single-file up narrow tracks. The Italians bomb Patras, Greece, the main port of Athens in the Morea, and airfields around Athens. 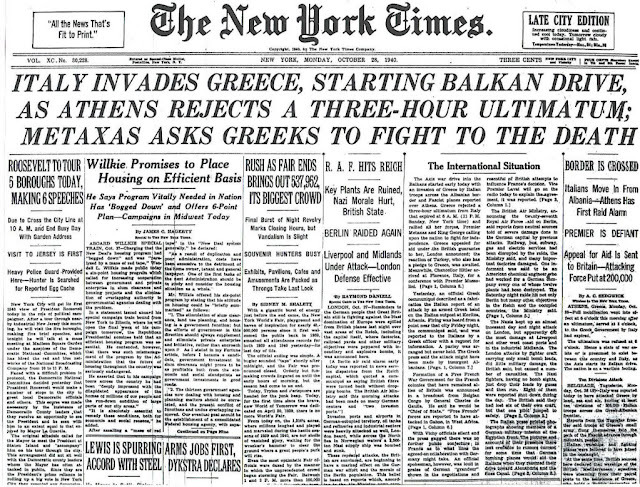 The Greeks shattered forever the myth of Axis invincibility. Greek troops defending against the Italians in the mountains. When you speak of Greek warriors, don’t say Greeks fight like heroes but that heroes fight like Greeks. Churchill is probably secretly relieved by the invasion, because it dilutes Italian strength away from the Egyptian front and also takes pressure off of Malta. He plans on sending British troops to Crete, which shields the British naval base at Alexandria. However, he is not the only one eyeing Crete. German/Italian Relations: Hitler has been informed of the Italian plans to invade Greece in recent days, including the date and time. He has done nothing to dissuade Mussolini from attacking and has expressed no sense of ill-will about the somewhat reluctant Italian attitude toward keeping him informed of developments. The myth persists that Hitler is "taken by surprise" by the invasion, but the evidence proves that this is incorrect. A better take on the situation is that Mussolini is acting alone or with Hitler's tacit approval, and Hitler chooses not to interfere. However, different accounts of his attitude throughout the week present a mixed picture of exactly what he knows and is expecting, with evidence on both sides of the ledger. Hitler's train "Amerika" is travelling through Bologna at 10:00 when he receives the news of the Italian attack. According to his adjutant Major Engel, he begins "swearing and cursing" at his liaison officers in Rome for not informing him previously. He calls them "idlers, but not spies." All of this is odd, given the clear evidence in previous days that in fact his liaison officers in Rome have kept him very well informed, with a communication at noon on the 27th informing him of the precise start-time of the invasion. Besides... shouldn't his allies the Italians have told him? All sorts of guesswork has been made as to why he reacts this way upon learning the news, when it is clear that he has been informed previously of what was planned. Fuhrer, we are marching! 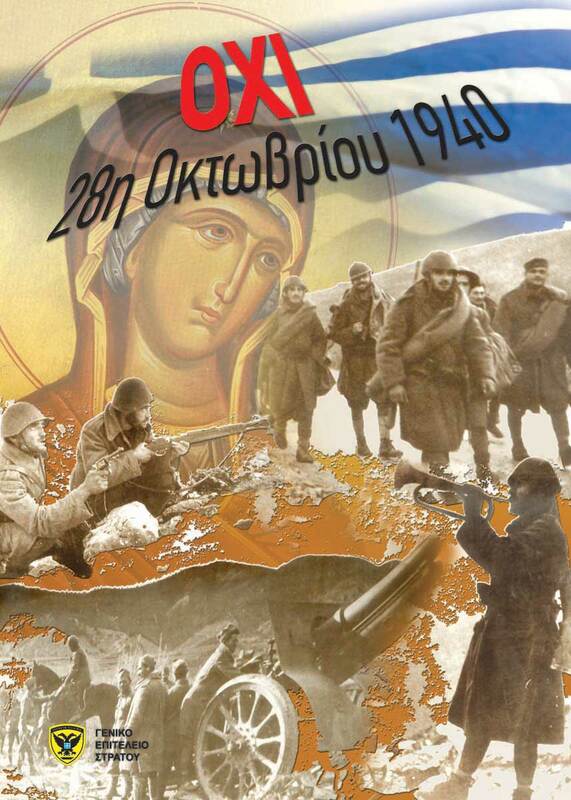 This morning a victorious Italian army has crossed the Greek border! They - Hitler, Mussolini, Italian Foreign Minister Count Ciano and German Foreign Minister Ribbentrop - adjourn to the Palazzo Vecchio in Florence. As always, it turns into a Hitler monologue, in which he rambles on upon his recent meetings with Franco and Petain. The gist of his rambling is that he does not like Franco or Laval, but Petain was a true gentleman (Petain was double-dealing the whole time with Churchill). He also brushes aside Mussolini's recent demands for territory in southern France and other concessions as being unnecessary. Don't worry, in two weeks, it will all be over. Hitler departs at 18:00, having spent only about seven hours at the meeting. The Italians are happy because Hitler has reassured them that Italy is his most important partner, while Hitler is relieved because Mussolini has given up his exorbitant demands for concessions. However, after leaving, Hitler rails that the invasion was "pure madness" and Mussolini should have left Greece alone and invaded Malta instead. Meanwhile, the invasion of Greece continues. Battle of Britain: The weather remains acceptable for flying, though low-hanging clouds make the conditions quite different at ground level, with typical drizzly weather. There are only a few big raids during the day and long periods of little activity. The Luftwaffe focuses on convoy attacks in the morning and does not attack inland until the afternoon. At 13:00, German fighter-bombers (Jabos) crosses into Kent and splits up to attack various targets. The RAF sends up No. 257 Squadron to intercept the fighters of JG 27. The Germans claim two Spitfires, but the RAF does not lose any planes. At 16:00, the Luftwaffe sends across a variety of formations, including medium bombers such as Dornier Do 17s, some heading up from the south. They attack the Isle of Wight and Portsmouth without apparently any losses on either side. Other raiders, all Jabos, cross over at Dover and points south. This is a moderate-sized raid, and the RAF puts up nine squadrons in the defense. JG 51 and 53 tangles with the Hurricanes and Spitfires and comes off the worse for wear. After dark, the Luftwaffe starts strong but the attacks peter out quickly. London, Birmingham and the Midlands are the primary targets, but there are scattered attacks all across southern England. Several RAF fields are attacked by a bomber or two each including Biggin Hill, Digby, Linton-on-Ouse, Driffield, Binbrook, and Massingham. In London, there is a huge fire at the Royal Arsenal at Woolwich and a public shelter is hit at Southwark, which causes 100 casualties. Biggin Hill is the airfield hit the hardest, with an estimated 300 bombs falling. The Luftwaffe drops a new kind of incendiary which acts somewhat like napalm on RAF Digby, but by the time it hits the ground it is inert. Birmingham also is hit with incendiaries as well as high explosives. New Street Station is hit by incendiaries at platforms 3, 4 and 5, while the Midlands Parcel Office also is hit. Overall, the Luftwaffe took a beating in the air. It loses about ten planes, while the RAF records show no losses. It is a half-hearted attempt at best by the Luftwaffe, which almost seems bored with the whole campaign by this point. 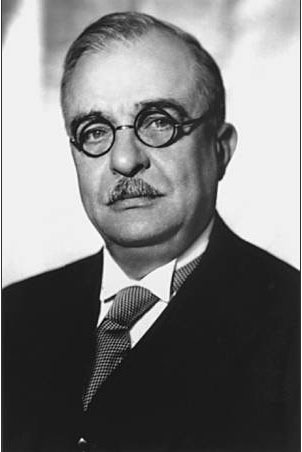 Ioannis Metaxas was no saint: he was a typical European strongman of his day. He had studied at the Prussian Military Academy and knew how to fight. 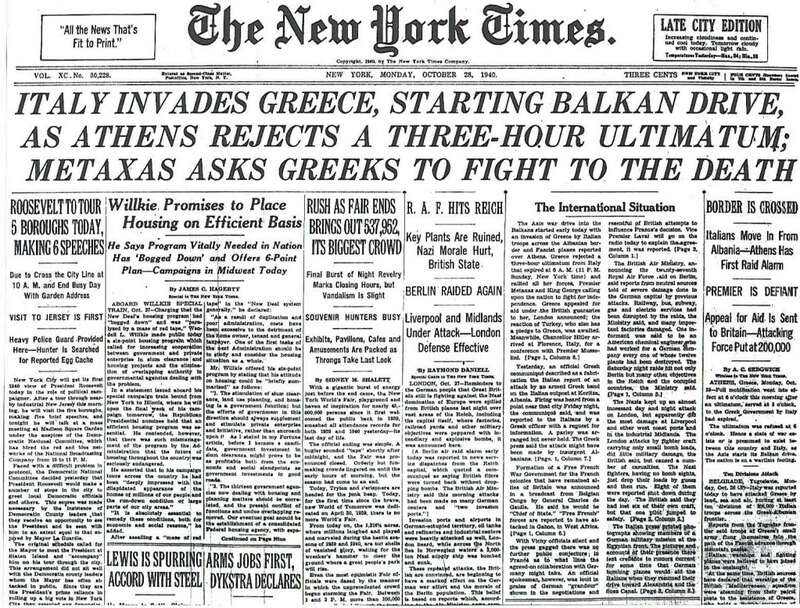 Metaxas is revered in Greece not for his rule, but for saying Oxi! (No!) to the Italians. European Air Operations: RAF Bomber Command attacks the ports of Kiel, Wilhelmshaven, Bremen, Hamburg, Emden, Cuxhaven and Boulogne. In addition, it bombs oil installations at Cologne, Hamburg and Homburg and railway infrastructure at Cologne, Coblenz, Krefeld and Mannheim. Other targets include various airfields in northwest Europe. Battle of the Atlantic: Weather is worsening in the North Atlantic as a late-season hurricane heads north. This is going to damage ships over the next few days. All of the mining that the Luftwaffe has been doing recently continues to pay off, though the ships sunk tend to be smaller craft, coasters and tugs. U-32 (Kptl. Hans Jenisch) maneuvers into position around midnight to finish off the Empress of Britain, the stricken 42k ton liner which is disabled and under tow back to the Clyde. Jenisch orders three torpedoes pumped into the liner, the first of which detonates prematurely but the latter two of which blow holes in her side. The liner immediately settles in the water and lists. It sinks around 02:05 northwest of Bloody Foreland, County Donegal. There is only a skeleton crew remaining on board, and they escape without incident. The ship capsizes and settles upside down at 500 feet (150 m). Rumors persisted for many years that there was a large cargo of gold aboard, but if there was, subsequent investigation revealed that it had been removed after the initial air attack on 26 October. U-32 and Oberleutnant Bernhard Jope, the pilot of the Focke-Wulf 200C Condor which bombed the liner originally, share equally in the sinking, each being credited with 1/2 ship and 21k tons of shipping sunk. The British Home Fleet is alerted to the passage of the German battlecruiser Admiral Scheer to the Atlantic. A large force sets out to the Denmark Strait to intercept it, led by battlecruisers HMS Hood and Repulse and aircraft carrier HMS Furious. The object of all this attention, the Admiral Scheer, is safely in port at Stavanger, Norway. Force H at Gibraltar, led by battleship Barham, puts to sea after receiving reports of a Vichy French destroyer flotilla putting to sea from Casablanca. British 420 ton cargo ship Wythburn hits a mine in the Bristol Channel off Newport, Monmouthshire. Five men perish. British 98 ton tug Devonia also hits a mine and sinks in the Bristol Channel off Newport, Monmouthshire. There is one survivor and three deaths. British 490 ton coaster Sagacity hits a mine and sinks in the Humber southwest of Spurn Point, Yorkshire. Everybody aboard survives. British 2719 ton freighter Sheaf Field hits a mine and sinks in the North Sea off the River Deben, Suffolk. All 26 aboard survive. The Luftwaffe bombs and sinks 96 ton Royal Navy trawler HMT Harvest Gleaner off Southwold, Suffolk in the North Sea. There are four deaths. The Luftwaffe torpedoes and sinks Norwegian coaster H.J. Kyvig in Sunnfjord, Sogn og Fjordane. Five men perish. Soviet icebreaker Malygin sinks in a storm off Kamchatka. All 98 men aboard perish in the frigid water. Royal Navy destroyer HMS Walpole hits a mine and is badly damaged. It is taken under tow by HMS Windsor. Royal Navy minelayers HMS Teviotbank and Plover and destroyers Intrepid and Icarus lay minefield BS 43 in the North Sea. The Germans seize Greek freighters Belgion (2844 tons) and Leontios Teryazos (4479 tons) at Bordeaux. The Italians seize Gree freighters Athinai (2897 tons) and Maria Nomikou (1165 tons) near Messina. Convoy HX 84 departs from Halifax. Metaxas inspired fierce loyalty and still does in some people. His legacy is controversial. Battle of the Mediterranean: Royal Navy aircraft carrier HMS Eagle patrols off western Greece, but despite the intense Italian activity around Albania finds no targets. At Malta, the garrison is on edge because of the Italian invasion of Greece. The British War Cabinet meets at 17:00 and decides that Malta would be the best spot from which to launch air raids on Italy. It is close enough to attack Rome and achieve some political effects. They decide, however, to send a battalion which had been allocated to Malta to Crete instead. The Royal Navy priority from this point forward will be Crete, not Malta, with naval forces focusing on defending it. In essence, Malta increasingly will have to fend for itself. Battle of the Pacific: After dark, German raider Pinguin and converted minelayer Passat begin laying mines, the Pinguin off Sydney, Australia and the Passat in the Banks Strait off Tasmania on the shipping lanes to Melbourne. They will continue doing this for the next ten days. Anglo/African Relations: South African Prime Minister Jan Smuts, Anthony Eden, General Wavell and Emperor Haile Selassie of Abyssinia meet in Khartoum to discuss strategy. Spy Stuff: Alan Turing, in charge of the Enigma code-breaking operation, writes to Winston Churchill complaining about lack of support. Churchill orders that the code-breakers be given what they need. British Military: General Neil Ritchie becomes commander of the British 51st Infantry Division. US Military: Heavy cruiser USS Louisville arrives in Montevideo as part of the US Navy's continuing "Show the Flag" visits. Vichy France: Pierre Laval, who has been acting unofficially as Marshal Petain's right-hand man in dealings with Germany, officially becomes Foreign Minister. China: In the continuing Battle of South Kwangsi, the Japanese withdraw from Lungching and head for Nanning to recover it. The Chinese take possession of Lungching. New Zealand Homefront: The New Zealand 8th Infantry Brigade begins leaving Wellington for Fiji. Belgian Homefront: In occupied Belgium, the Nazis place new limits on Jewish employment and business dealings. British Homefront: The authorities continue evacuating children from London to rural areas. The government reports that 489,000 children have departed to date. Evacuations overseas have been halted due to losses at sea. October 11, 1940: E-Boats Attack!